St. Charles Ranked As One of the Best Small Towns in America! Escape the hustle and bustle of larger cities by finding a quaint, tight knit smaller community instead. Many small towns across the country are filled with spectacular amenities while offering short commutes to larger metropolitan areas. They are perfect for families and individuals who are looking for more space, affordability, and a high quality of life. Looking for the perfect small town to call home? Come to St. Charles, which was ranked among the Best Small Cities in America! Financial website WalletHub recently conducted a study to rank America's smaller cities based on affordability and quality of life. The study ranked 1,268 cities across the country that had populations between 25,000 and 100,000. 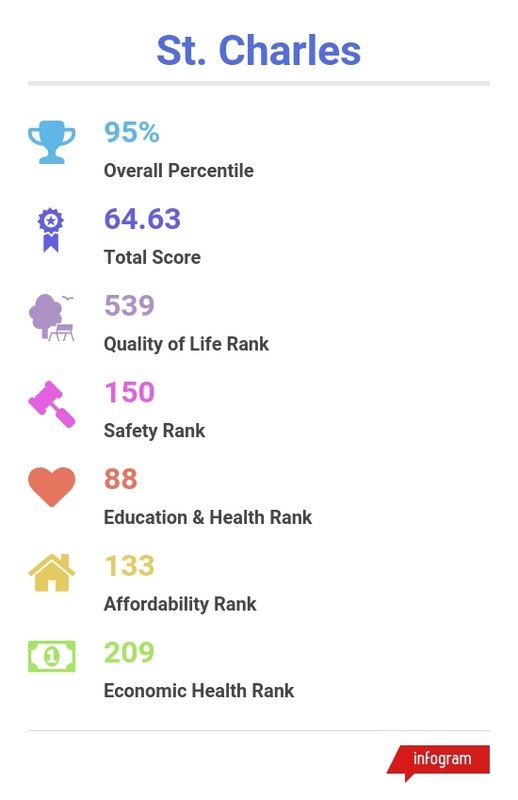 It focused on 33 key livability indicators. These indicators included a variety of factors that contribute to a high quality of life such as housing costs, quality of school-system, access to amenities and entertainment, commute time, recreational facilities, and more. When the results came in......St. Charles was ranked at the top of the pack! Interested in Buying your dream home in this great American small town? Check out all the Current Homes for Sale in St. Charles! Give The Rullo Team a call today or visit our website at http://www.therulloteam.com/. Hiring a mover is not something most of us do every day, and it’s difficult to know whether the quote you received is fair or a blatant rip-off. The Rullo Team wants every aspect of your move to go smoothly, and we recommend arming yourself with knowledge before searching for a moving company. If you’re planning on living in metro Chicago, follow these tips for hiring the right mover. Do your homework and then do it again Make sure the companies you work with are licensed and insured. Be sure to check with the Better Business Bureau to see if the company has received any complaints. Know the details The best way to get an accurate quote is to provide the mover with a detailed picture of the job. Know exactly how much needs to be moved and when. You can’t give enough details, so be as meticulous as possible. Compare quotes Some quotes will be higher than others, but that doesn't mean you should dismiss them out of hand. This could mean that one company has more experienced and better-compensated employees which will improve the quality of work. Also, understand exactly what the fee covers before you agree to anything. The Rullo Team understands the entire process of buying and selling homes in metro Chicago. If living in metro Chicago is in your future, contact us today. Avoid moving stress by planning ahead for the challenges coming your way. Making the move to metro Chicago is exciting, but once the joy of landing the perfect subsides and thought of moving all your stuff sets in, it can become a nightmare if you don’t plan. Packing and Unpacking Even the neatest homemakers of us can collect a lot of stuff. Just remember that it’s better to sell it or give it away than move it. Be ruthless when cleaning out rooms and get rid of things you don’t need.. Moving Without Professional Help Make sure you recruit at least one friend to help with the move. You risk injury when moving heavy objects and most of the time it’s impossible to move things like refrigerators and couches. Also look for tools to help move big pieces like dollies, straps and other tools the pros use. Plan for Home Improvement Projects Even if your new home is in stellar condition there will be projects to complete to make the place your own. Plan for the money and time needed to complete the projects before you move. Considering a move to Chicago’s metro area? Make The Rullo Team your first call. Ask for help In order to curb moving costs consider how you can ask friends and family to help. You can request for others to save boxes for you, help with a garage sale, or participate in the actual move. De-clutter and downsize By eliminating unnecessary items before you move you'll have the opportunity to save time and money. Professional movers charge by the total truck weight and if you're moving yourself more items will require a larger truck rental or more trips between houses. Run the numbers When you are moving you have a variety of choices; professional movers, renting a moving truck, or doing it with your own truck. Each has its own benefits and drawbacks and represent a wide range of prices based on the distance of your move and the amount of belongings you're moving. Before you decide on your moving method calculate the total cost of each option. Need a reason to relocate to the Chicago area? The experts of The Rullo Team have a great one: construction and growth. McGraw-Hill Construction created an analysis that ranked the nation's top 20 metropolitan areas for construction. This study included construction for single-family homes, multi-family homes, office spaced, retail spaced, warehouses, healthcare facilities, educational buildings, manufacturing plants and research facilities. Chicago ranked No. 5 on the list. McGraw-Hill says decided to measure construction starts because they are a leading indicator of economic activity, and the statistics of construction are often used by builders, developers and economists. The rest of the list is below. Take a look. The Rullo Team can provide all of the expertise you need to get started in finding the right place in the Chicago Metro area. And when you are ready to close on the house, our team wants to help you pay only what you have to, nothing more. Below you'll find a list from HSH.com referencing ways to cut costs when you close on a home. Make sure to look over all of the tips, and when you want to go looking for the ideal home, give us call. No.1 Know what the closing costs will be in Illinois since government fees will vary from state to state. No. 2 Know what is a legitimate fee and what is not; fees typically are these four types: lender, title and third party, escrow and interest, and government. No. 3 Know how to use your Good Faith Estimate wisely; get a GFE from multiple mortgage lenders which will help you comparison shop for the best mortgage rates. No. 4 Know that you should scrutinzie your HUD-1 statement; do not not rush through this phase, and thoroughly review your HUD-1 to make sure the fees it shows are correct and consistent with what you've been told. No. 5 Know how to use your time; since a HUD-1 statement must be provided at least 72 hours before closing, this is your chance to look over everything without feeling rushed or pressured at the closing table. The Rullo Team has vast knowledge of real estate news and is delighted to provide valuable information on buying your first home and ways to save money when purchasing a house. Use our expertise to choose the right Chicago Metro home and community for you and your family. Call us today at 630-513-1771 for more information.